by J.W. Courter. 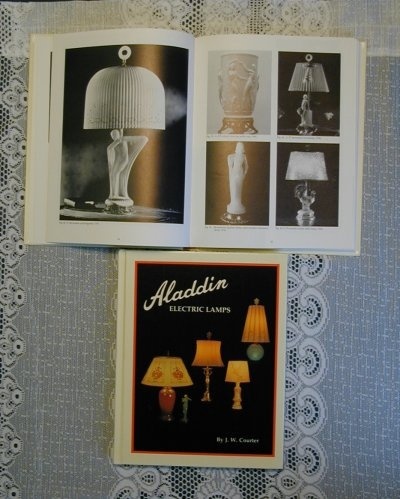 The Aladdin Electric Lamps Book is a softbound book filled with history and collector's information on the Electric Lamps produced by the Aladdin Kerosene Mantle Lamp Company in the 1940s-1970s. The Aladdin Electric Lamps Book is printed in color, 8 1/2" X 11" size, and has 229 pages filled with over 96 illustrations. 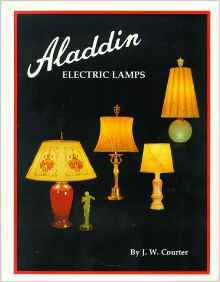 This book also shows 84 different lamp finials, and 154 pages from original Aladdin catalogs. Over 1100 lamps are pictured in this book, as well as information and history on early electric lighting, Aladdin glass, and much more. The Aladdin Electric Lamps book is now in it's 3rd printing. 84 different lamp finials, and 154 pages from original Aladdin catalogs. The companion book, Aladdin Lamps Collectors Manual and Price Guide for Aladdin Electric Lamps #5 is also available. J.W. Courter retired as professor of horticulture University of Illinois in 1991. Collector, author and publisher of books on antique lamps and lighting. Courter organized The Aladdin Knights of the Mystic Light in 1973 and publishes the newsletter Mystic Light of the Aladdin Knights. Over 1000 attend the Gathering of Aladdin Knights, who sponsor an International Lamp Show & Sale, each year.